Orbit Homes is apart of the new display centre in Clyde, Selandra Rise, opening Saturday 28th January. At Selandra Rise the aim is to create a unique community where residents feel a sense of health and well-being – in essence, a place where people can look forward. The estate is the result of an innovative partnership between Stockland, the Planning Institute of Australia (PIA), the Growth Areas Authority (GAA), the City of Casey and the local community. Together, they’re working to deliver one of the most livable communities ever developed in Victoria. Thoroughly planned and designed to grow as you grow, Selandra Rise’s range of facilities will ensure that residents’ everyday needs can be met at every stage of life. Orbit’s display centre will have a total of four homes on display, three single storey homes and one seriously impressive double storey home. 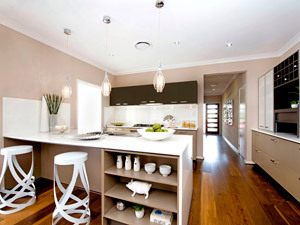 These homes are all BRAND NEW designs to bring in 2012 with style! The Nubury 26 belongs to the Access Series and the Trinity 33, Loxton 29 and Seavue 40 (double storey) all belong to the Signature Collection. The most exciting news about this display centre is it will host some beautiful home finishes and new design techniques which you will most definitely get excited about. So get out to the Selandra Rise Orbit Display homes to see some amazing new design and decorating techniques come alive.